With the olympics fast approaching, I have decided to feature one African athlete per week to keep us in Olympics mood. 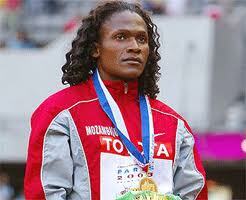 Today, I would like to talk about an athlete hailing from Mozambique: Maria Mutola. Mozambican writer Jose Craveirinha to pursue track and field. Her very first olympic was in 1988 at the Seoul Games, at the age of 15. She finished last, but this made her even stronger. After that, she dominated the 800 m distance, winning the gold medal at the IAAF World Indoor Championships in 1993 and 1995, and the Stuttgart 1993 IAAF World Championships. She won the bronze medal in 1996 at the Atlanta Olympic games, and finally won a sweet Gold medal at the Sydney Olympic Games in 2000. Mutola retired from track and field at the 2008 Beijing Olympics where she sadly finished 5th, after being in contention for a medal. Mutola is often ranked as the greatest female 800 m runner of all time, since her consistency, her record at major championships and her ability to compete at the highest levels of the sport for well over a decade are unmatched. As a sports fan, I watched Maria at the 1995 World indoor games in Barcelona. The year 2000 was so special, as we all saw Maria finally lift the Olympic gold medal for Mozambique, at the Sydney games. 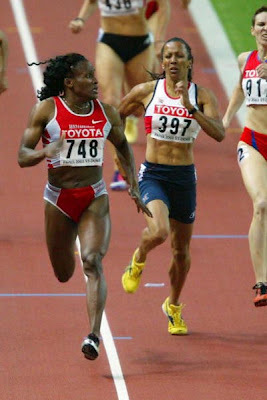 In 2003, she became the sole winner of the IAAF $1million Golden league title, for being undefeated throughout that year at all major competitions. I have always been a big fan of hers, even though I always thought that she had too much of a ‘male’ physique. 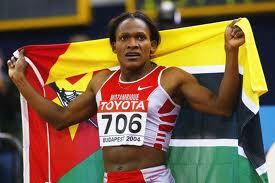 With that physique, she ran with power and grace, and raised the flag of Mozambique with pride. Greatness to you Maria, you’ve made us proud! You would think that with the money she has made, she would donate to the park where all the rhinos have been slaughtered by poachers. This type of activity must be stopped, or those idiots will keep killing until entire species are extinct.